"Like" token, awarded by Quiddity. The DM extends the link until the first "word boundary"
The inconsistency persists until the next re-render. The DM behaviour cannot be replicated in current browser CEs (because IME stability constraints prevent re-rendering whilst typing text) and is not always desirable (because link text is often multi-word). 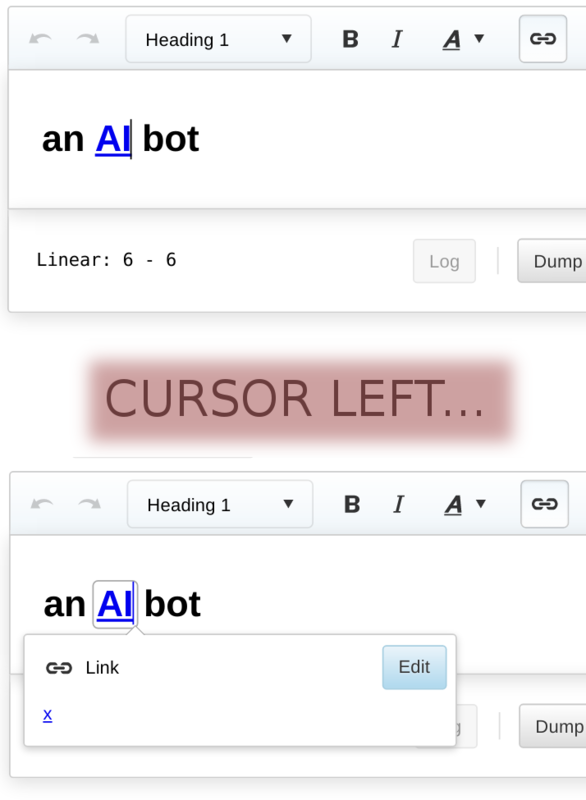 Show clearly in the UI whether the cursor is inside or outside the link. Spend a cursor press crossing into/out of a link (without changing the DM offset). Use unicorn-like image nodes to impose indefinite CE continuation inside links (and none outside). Calculate the DM insertion annotations from the observed CE ones. dchan raised the priority of this task from to Normal. 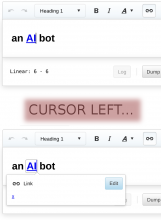 dchan added projects: VisualEditor, VisualEditor-ContentEditable. dchan added subscribers: Catrope, • TrevorParscal, Jdforrester-WMF. dchan set Security to None. dchan moved this task from Backlog to Hacking proposals on the Wikimedia-Hackathon-2015 board. Did someone work on this project during Wikimedia-Hackathon-2015? If so, please update the task with the results. If not, please remove the label. Jdforrester-WMF added a subscriber: Nirzar. Jdforrester-WMF edited projects, added WMF-deploy-2015-09-22_(1.26wmf24); removed Patch-For-Review, Design-Research-Backlog. Would it be possible to have the cursor default to outside the link, after inserting it? Because: With the Current/updated behaviour, I have to add a [right-arrow] keypress, in order to keep typing, after entering a link. This is complicated, non-intuitive, and not consistent with other richtext editors (afaik). It's especially a concern here, given the previous link continuation bug behaviour, where I'm accustomed to an erroneous display, and I've learned to ignore link text continuing past where it was meant to end (until I hit [enter] or otherwise trigger a re-render). Moved to T113082: On applying new link annotation, place cursor outside of the link.